Each Holy Idea represents a particular direct perception of reality as a specific characteristic or facet of the unobscured perception of what is. The nine Ideas, then, provide us with a comprehensive view of objective reality. The transmitted view of the Enneagram is that each ennea-type fixation is the expression of a limited mental perspective on reality, and that each of the nine egoic perspectives is the direct result of the loss or absence of the enlightened perception of one of the Holy Ideas. 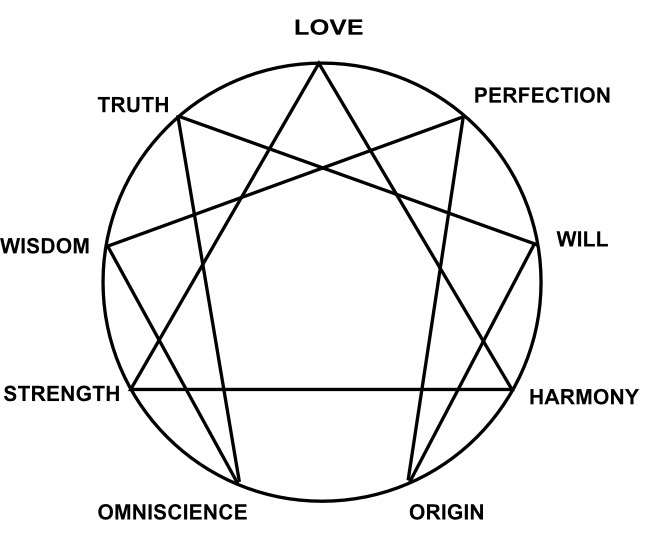 The Enneagram of Fixations reflects the deluded or egoic view of reality, expressing the loss of the enlightened view, which is represented by the Enneagram of Holy Ideas. A Holy Idea is a particular unconditioned, and hence objective, experiential understanding of reality. For example, from the perspective of one Holy Idea, reality is experienced as a nondual unity of Being, and the loss or absence of this Holy Idea leads to the delusion of duality, which manifests in the conviction that there are ultimately discrete objects in reality. There are nine specific delusions reflecting the loss or absence of the nine Holy Ideas. These delusions function as the primary principles of egoic existence. Each delusion forms the center of a psychological complex, which we view as the core of that particular fixation. The Holy Ideas are not exactly states of consciousness; they are certain ways of experiencing reality. So you could be experiencing a particular essential state, and at the same time you might experience transparency or not. You cannot, however, experience transparency without experiencing some quality of Being, because if you are not experiencing Being you are experiencing ego, and the Holy Ideas are not accessible in the egoic realm. Holy Perfection is difficult to define exactly, because like all the Holy Ideas, it is a universal concept, a Platonic Form. As such, the perfection we are discussing cannot be analyzed or reduced to simpler elements; it is a pure form of manifestation. From the perspective of Holy Perfection, everything looks just right, everything feels perfect and complete, every action is correct and graceful. We see that whatever happens is the perfection of Holy Truth, which is everything. We know this with certainty, without necessarily knowing what makes everything perfect. This sense of the intrinsic rightness of the reality that is inside and outside everyone is a feeling, a recognition, an action, of intelligence. It involves no conceptualizing about perfection. Holy Perfection reflects the intactness, the completeness, and the glory, of what is. It is the perception of the perfection of all phenomena from every angle, on all levels, all the way through. This is what makes Holy Perfection holy, objective, and egoless. If something were seen as perfect and another thing not, or if it were perceived as perfect now and at another point no longer perfect, this would not be Holy Perfection, but rather, the ego’s sense of perfection based on subjective judgment. Because what happens is the functioning of the organism that is the universe, there is no randomness to the changes that occur within it. Events may appear random to our subjective point of view, but from an objective perspective, an inherent intelligence is seen to be operating, moving things in a particular direction. As Albert Einstein is reputed to have said, “God does not play dice with the universe.” This means that the universe does not function mechanically; it is a living, conscious presence, so its functioning is an organic unfoldment. Perceiving that the functioning of the universe has a particular momentum, and moves in a particular direction with a particular intelligence and a particular force, is the meaning of Holy Will. You are seeing, in other words, that there is a unified will in the total functioning of the universe. Implicit in this perception is seeing all change in the universe as a functioning, a doing. This means that the movement of a star is action and not simply change; it is the action of Holy Truth..........See also p119. So Holy Will is nothing mysterious, but very few people actually come to know it directly. It is a very subtle and deep perception of the operation of Holy Truth. At the same time, we can experience it as whatever is happening at any moment, whether it is a supernova exploding or your superego attacking you. All of it is Holy Will..........See also p119. Holy Freedom, the other aspect of this Holy Idea, is understanding functioning or will from the perspective of Holy Transparency. Holy Transparency, discussed in the previous chapter, is the perception that one exists as a human being who is completely inseparable from the whole. Therefore, your functioning and your actions are inseparable from the functioning of the whole, and are in complete harmony with its functioning. You are, in a sense, a co-creator, a participant in the expression of Holy Will. This is the experience of Holy Will acting through you, and we call that experience Holy Freedom. Holy Freedom, then, means that your action is not separate from the action of the universe, so your will is not separate from the will of the universe. There is, therefore, no conflict between your will and the will of the universe; your will is not opposed to that of the universe or disharmonious with it. So Holy Law means that the whole universe changes and transforms as a unity, like one ocean whose surface is in a constant state of change and transformation, continuously rippling as one. It is not that things are changing in unison, but that one completely unified mass is moving without the possibility of any part going its own way or changing, independent of the rest. If one thing were to change separately, the unity of existence would be broken..........See also p266. Holy Harmony, the second name or nuance of this Holy Idea, points to two primary insights regarding Holy Law. It refers to Holy Law, but focuses on certain things about it. The first insight is that because everything happens as one action, as one unified flow, the pattern of this flow is experienced as the complete harmony of all the various happenings contained within it. The perception of this harmony is that it is beauty, it is love, it is grace, it is luminosity, it is abundance and fullness. So all movements, changes, and actions form a unified and harmonious, patterned flow. This flow is aesthetically and absolutely appealing and satisfying, and on a practical level, is totally fulfilling. There are no incongruities, no inconsistencies, no contradictions between the various local changes and occurrences because they are not separate from each other. Contradictions can only exist from the perspective of an individual who sees one thing happen and then sees another thing happen, which she thinks is contradictory to the first thing. But if there is only one unified unfolding, how can there be inconsistencies? What we call disharmonies and inconsistencies are part of the harmony when seen from this larger perspective..........See also p269. The difference between Holy Faith and Holy Hope is that faith is a trust in the fact of the presence of Being, while hope is trust in the creative flow of the functioning of that presence. So faith gives you the sense of being supported and taken care of by the universe, while hope gives you the sense that as things unfold, everything is and will be fine. Holy Hope, then, is an openness, a curiosity, a receptivity, and an optimism about how things are going to reveal themselves, because you are certain that the optimizing thrust of reality moves toward harmony and fulfillment. Even putting it in this way makes the hope sound too specific—it is just an open optimism about life. What does this mean? Each Holy Idea, as we have seen, presents a particular implicit truth about reality, a certain facet of how reality is and how it appears. If we perceive reality as it is without any filters, we will see these nine Ideas as different manifestations of it. They are inseparable, since they are nine different aspects, expressions, or elements of the same experience. The facet of reality that is highlighted by Holy Origin is the perception and understanding that all appearance (meaning whatever can be experienced and perceived—inner or outer) is nothing but the manifestation of Being, the Holy Truth..........See also p186. This inseparability of appearance from its Source is the perception elucidated by Holy Origin. This is a very deep understanding which is not easy to apprehend. Without it, we can have experiences of our essential nature which actually feel separate from who we are. For instance, we might have a profound experience of the presence of boundless compassion or of indestructible strength, but actually feel that we are having an experience of something other than who and what we are. Essence can feel like something that comes and goes, rather than seeing that our perception of our inner nature is what comes and goes because that perception is not clear. Holy Origin is the knowledge that you and your essence are not two distinct things. Essence is the nature of the soul. We might believe that the Divine, or God, is something outside ourselves, residing somewhere else, which we are either connected to or not. Believing that you can be connected or disconnected from God means that you don’t understand the Idea of Holy Origin. Our understanding of this Holy Idea expands on Ichazo’s definition above. Holy Omniscience is the Universal Mind, which is the multiplicity of existence within the unity described by Holy Truth. Universal Mind includes all that exists in its various manifestations, with all the various colors, the richness, and the continuous transformations of reality. It could also be called God’s Knowledge, since what God “knows” is the whole universe in all its multiplicity. You might say that Holy Omniscience is the same perception as Holy Truth, but with a different emphasis. In Holy Truth, the emphasis is on the unity of the universe; it is all “of the same taste,” as the Tibetan Buddhists say. With Holy Omniscience, the emphasis is on the differentiations and discriminations within that unity. So the focus here is on the various parts, in all their variety and multiplicity, that together comprise the unitive whole. To perceive reality through the facet of Holy Omniscience is like looking at a whole Persian rug, but focusing on the different designs contained within it.......... See also p99. The other name of this Holy Idea, Holy Transparency, refers to oneness seen from the point of view of the individual. Instead of looking at the nature of reality from an “aerial” point of view, which would correspond to that of Holy Truth, we are seeing it from our human vantage point. It is the understanding of our place as human beings within the unity of existence, and from this perspective, we see that we are each an inseparable part of the whole, each a cell in the cosmic body, each a part of the “body” of God, inseparable from objective reality. The human being, then, is seen to be one of the differentiations of the Universal Mind. Most simply, Holy Faith is due to the recognition of Essence. By recognition, we mean the direct experience of Essence as one’s true existence (Holy Truth), as perfect existence (Holy Perfection), and as intrinsically good and loving existence (Holy Love). To completely recognize Essence means to recognize the three qualities of satchitananda—that it is a real presence, that it is intrinsically good, and that it is just the way things are supposed to be. We can refer to this realization of Essence as Holy Strength, meaning that the strength of the soul lies in its nature as Essence. Perceiving this truth is seeing one’s nature through this Holy Idea. The fact that Essence is the fundamental nature of the soul is its objective strength, and is what gives the soul its feeling of strength. To perceive this truth is to know one’s reality through the lens of Holy Strength. Holy Faith, then, is the effect of this realization or recognition upon the soul. Another way of stating this insight is that Holy Strength is the perception that the inner nature of the human being is Essence, and that as a result of this perception, the transformation that occurs in the soul is Holy Faith. So we are differentiating between the recognition of Essence as the inner truth of the soul and the effect of this experience on the soul. Holy Faith is a kind of knowledge, then, a conviction, a certainty. This use of the word faith is different from the conventional use of the term, which refers to a mental belief that is not based on our direct experience, but rather, on what we’ve been told by someone.......... See also p247. We have explored Holy Strength, which is the direct experiential recognition of Essence and its truth, its lovingness, and its perfection—the recognition that it is our essence, our innate nature. And we have seen how Holy Faith is the transformation that occurs in the soul consequent to the experience of Holy Strength. When the soul recognizes Essence, we see that this is what gives us strength and courage, and this transforms the soul through the action of what we call Holy Faith—not faith about a person or a particular thing, but faith in reality, in Essence. This faith is a heartfelt certainty, an unquestioned conviction that Essence is one’s innate nature. Along with this knowing comes the perception that it is constant and reliable, and you—rather than it—come and go. If you really know that Essence is your nature, to say that it comes and goes doesn’t make any more sense than saying that the atoms of your body come and go. Your perception of it might come and go, but that doesn’t mean that your inner nature comes and goes, as one often feels early on in the Work. Holy Wisdom is, like other Holy Ideas, a certain way of experiencing oneself and reality as a whole. If you have basic trust and you are being present, you realize that there is an evolution, a transformation that happens, and that there is a specific design to this evolution and transformation. This evolution happens according to a certain design—a design that is true for all human beings. This design is called the Holy Plan or the Holy Work. It’s a Holy Plan in the sense that there is a specific universal design—which is the same thing as the process of the cosmos or the macrocosm replicating itself in the microcosm. Holy Work is the actual evolution itself, the actual transformation, so it is seeing that there is an actual transformation progressing from one step to another, from one stage to another, and going in a certain direction. Perceiving this design and this process of transformation is Holy Wisdom, which is perceiving the Holy Work or the Holy Plan. So, again, it has to do with functioning—functioning from the perspective of a design. If you have this perspective, obviously you will have basic trust. Knowing that things are unfolding according to a certain design, you do not need to have your own plans. You don’t need to fantasize about how things should be. So we can see how the loss or the absence of this Idea leads you to fantasize about how things should be, how you are going to be, to make plans, to plan for the future. So according to the Idea of Holy Truth, reality, when seen objectively, has no divisions in it. It exists, it is now, and it is nondual. There is no me, no you, no other, no universe separate from God; no universe separate from the Void; no you and Essence, no personality and Essence; no physical body and soul—all these distinctions are illusions and are not ultimately real. There is only one thing, and it cannot even be called “one” because if you call it one, you are comparing it to two, and it is not one in contrast to two. It is nondual, an indivisible existence, no matter how you look at it or think about it. While the different teachings may emphasize different qualities of this unity, seeing it from the perspective of love or awareness, for example, the assertion here is that fundamental to reality is the fact of unity. All the religions assert this sense of the all-inclusiveness of reality. Another way of saying it is that God is everywhere, omnipresent. Holy Truth is the way that the teaching of the Enneagram of Holy Ideas expresses this understanding. Holy Love is not the feeling of love, nor the essential aspect of love. Holy Love is a quality of existence that makes that existence lovable. Its loveliness and lovableness is what generates in our hearts sentiments of love, appreciation, value, enjoyment, pleasure, and so on. So we are talking about the quality of lovableness of reality when it is seen without distortion, rather than through the filter of the ego. In other words, Holy Love is the fact that objective reality has an intrinsic quality of being wonderful and pleasing—it is intrinsically lovable. This is Holy Love— whatever it is that makes it lovely, enjoyable, lovable, whatever it is about it that we can’t help but appreciate. When reality is fully perceived, one cannot help but enjoy and appreciate it. One cannot but respond with awe when the Holy Truth is fully apprehended, and one cannot but be full of wonder when Holy Perfection is realized. One cannot but melt in appreciative sweetness when beholding Holy Love. Holy Love brings you the experience of love, but it is not the love itself; it is something much more comprehensive. It is a quality of reality as a whole and is very difficult to fully define. We could say that Holy Love is the intrinsic quality of the reality of Being that is nonconceptual positivity. It is pure and unalloyed blissfulness. It is the value-saturated quality of truth. It is pure goodness, the Good of Plato. The Holy Ideas constitute a map of the view of reality as unity. Each Holy Idea is a view of reality which reflects an understanding of the wholeness and unity of the world or universe, of human beings, and of the functioning of reality. The understanding of unity—the nonduality of the various elements and dimensions of existence and manifestation—is an element of every traditional spiritual understanding. Both Eastern and Western teachings that include a method of inner work toward realization of reality inevitably lead to the perception of the nonseparateness of human and world, physical world and consciousness, divine and mundane. Many of these teachings understand human suffering to arise from ignorance of this truth, that is, separation or alienation from awareness of the sacred or the real. The word holy in the language of the Enneagram is not used in the usual dualistic sense: that which is opposite to the bad, the mundane, or the human. Holy means objective, how things really are beyond the cloud of egoic experience.